Huskies coach Mark Manney knew his team could be good, but he's surprised that it is this good this year. Andover coach Mark Manney met with his coaching staff before this season started. The consensus was that rattling off 15 wins this year – if the Huskies played really well - would be a good number for the young team. His squad has surpassed that mark, with five regular-season games still on the schedule. Andover got win No. 16 on Thursday night with a 2-0 shutout of Centennial at Centennial Sports Arena in Circle Pines. The Huskies (16-4-0, 8-1-0) have won a season-high five in a row and grabbed the Northwest Suburban Conference North Division Championship. So, is Manney surprised at the results this season? Their last loss came on Jan. 15 in Moorhead. Their lone conference loss was a 5-1 decision at Elk River on Jan. 2. They swept the season series with Centennial (11-6-3, 5-2-2) and Blaine. They split with Elk River (a 4-1 victory at home) and have a chance to split with Maple Grove. Not a bad showing for the Huskies, who boast eight sophomores in the lineup. “We knew we’d be a good team, but we thought we’d be a year away,” Manney said. They’re getting the results now, though. Thursday’s first period was their best of the year, Manney said. The Huskies moved their feet and even got a few scoring chances but couldn’t cash in right away. Not even two minutes into the game, sophomore Michael Clough took a shot that bounced off the goaltender’s glove and trickled through the blue paint. The game remained scoreless near the end of the first period, and Manney thought those missed opportunities would come back to haunt his team in the end. The Huskies, ranked No. 8 in the latest Class 2A coaches' poll, had their top line of Brandon McNamara, Nick Dainty and Charlie Schoen out there in the final minute of the first period. They were tired, Manney said, but they buzzed about the offensive zone, trying to make something happen. The puck came across to junior forward Schoen, who scored his team-leading 18th goal of the season with exactly 21 seconds left in the period to give Andover a 1-0 lead. Schoen also had two goals and an assist in the first meeting between the teams, a 6-1 Huskies' victory in early January. That’s a confidence-booster heading into the locker room. The Huskies made it a 2-0 margin just 1:27 into the third period with a goal from sophomore Hunter Jones, who was left alone in front of Cougars senior goaltender Travis Allen and turned the opportunity into his fifth goal of the season. The Huskies outshot the Cougars 14-5 in the first period and 31-15 in the game. It was the fourth shutout of the season for the Huskies. Junior goaltender Ben Fritsinger held the Cougars off the board. Manney wasn’t the only one surprised at the team’s success this season. 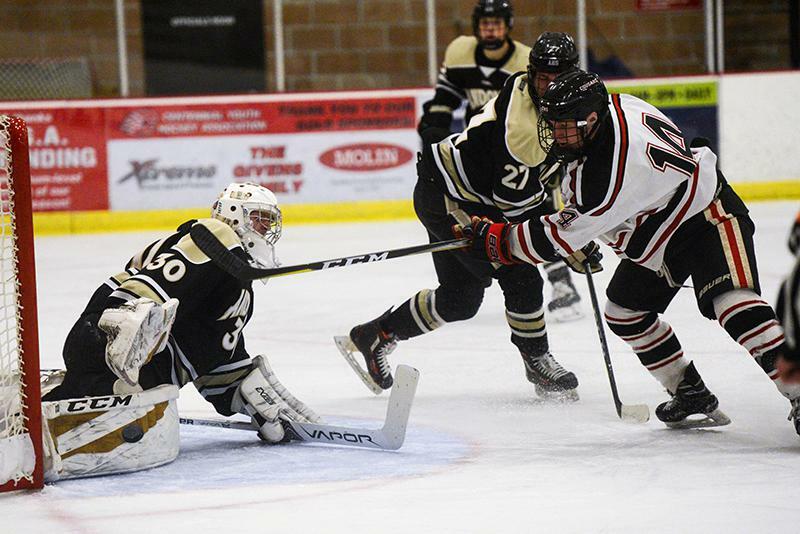 Andover took command of the Northwest Suburban Conference North Division with a 2-0 victory over Centennial on Thursday night at Centennial Sports Arena in Circle Pines. The win gives the Huskies a season-high five-game winning streak. Their last loss came on Jan. 15 in Moorhead. 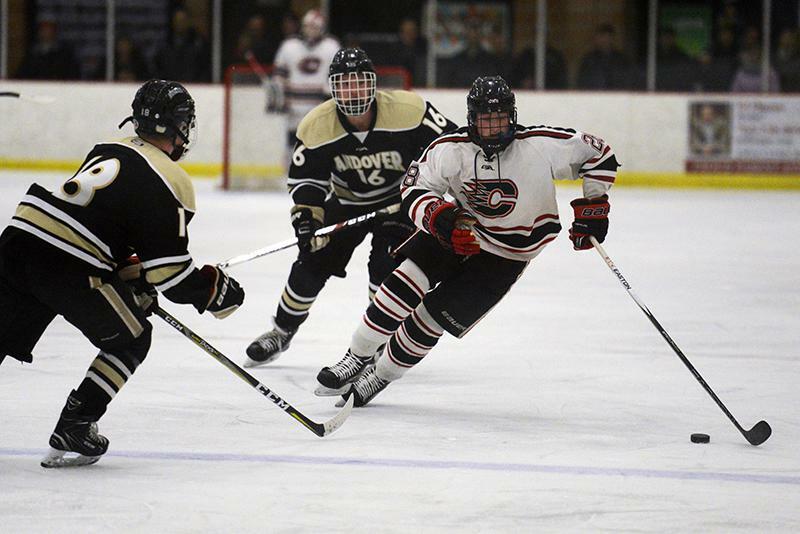 Coming in, Andover (16-4-0, 8-1-0) led Centennial (11-6-3, 5-2-2) in the division standings by just two points. The Huskies, ranked No. 8 in the latest Class 2A coaches' poll, bumped their margin to four points after Thursday’s tilt. Their lone conference loss was a 5-1 decision at Elk River on Jan. 2. Andover junior forward Charlie Schoen scored his team-leading 18th goal of the season with exactly 21 seconds left in the first period. He and his teammates cycled the puck around the offensive zone in the final minute, until Schoen zipped a slap shot past the Cougars senior goaltender Travis Allen for the 1-0 lead. Schoen also had a pair of goals and an assist in the first meeting between the teams, a 6-1 victory at Andover in early January. The Huskies made it 2-0 just 1:27 into the third period thanks to sophomore Hunter Jones, who was left alone in front of Allen and turned the opportunity into his fifth goal of the season. The Huskies buzzed around the offensive zone early and often. Not even two minutes into the game, sophomore Michael Clough took a shot that bounced off the goaltender’s glove and trickled through the blue paint. The Huskies outshot the Cougars 14-5 in the first period and 31-15 in the game. It was the fourth shutout of the season for the Huskies. In goal, junior Ben Fritsinger stopped 15 shots for the Huskies, while Centennial's Allen made 29 saves. Allen also stopped Andover’s Harrison VanderMey on a penalty shot with 11:36 left in the third period.